Go ahead after your exit you will see some stairs. Get down the stairs and go left, you will find taxi. It will take 20~28 CNY to bring you to Nanjing Metropark Hotel, Nanjing Hanyuan Masnion, or Zilu Hotel on the campus of Nanjing univeristy of Science and Technology. Go to ground level by stairs at left side after your exit. Walk about 60 meters to the southeast of the stairs and you will arrive at a bus station, where you can find the stop for bus line 36. Pay 1~2 CNY to the coin box when aboard the bus. l Get off at the 8th stop (ZhongSanMen stop) and go back ~50meters at the opposite side of the road, for Nanjing Metropark Hotel. l Get off at the 10th stop (WeiGang stop) you will see a traffic signals. Go right (south) ~200 meters you will see Nanjing Hanyuan Mansion at your left. l Get off at the 12th stop (LiGongDa stop―the stop for Nanjing University of Science and Technology), go ahead (eastern) ~60 meters, you will see the Main Gate. Refer to the map to find Zilu Hotel. The bus runs from 6:00 in the morning till 21:00 in the evening. Go to right after your exit. 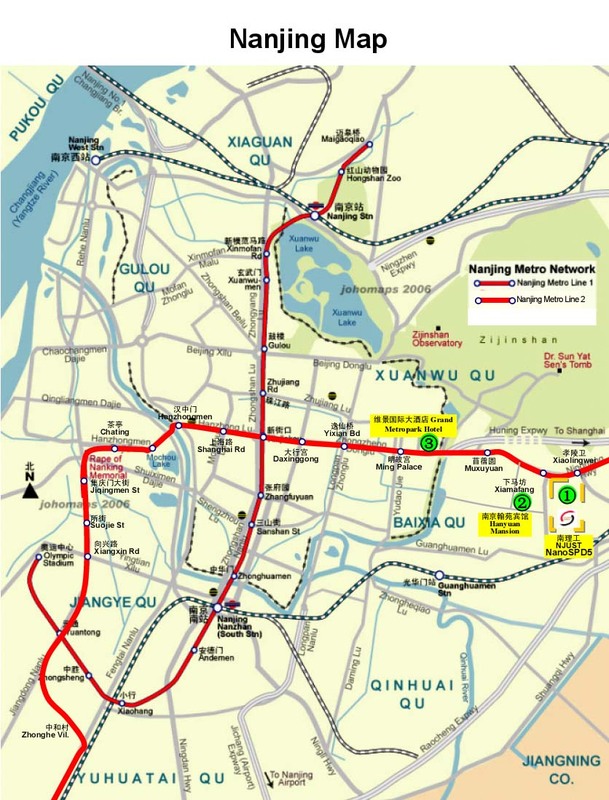 Take subway line 1 (the only subway line at the station) go to Xin Jie Kou, and transfer to subway line 2 at Xin Jie Kou. l Get off at MingGuGong station, and go to east ~300 meters at ground level to Nanjing Metropark Hotel. l Get off MuXuYuan Station, and go east (climbing up along the road) ~ 300 meters you will see a traffic signals. Go right (south) ~200 meters you will see Nanjing Hanyuan Mansion at your left. l Get off at XiaoLingWei Station, go east about 20 meters and turn right, and go ~200 meters you will see Gate No. 1 of Nanjing University of Science and Technology. Refer to the map to find Zilu Hotel. The Subway runs from 6:00 in the morning till 23:00 in the evening. Go ahead after your exit and you will see a line of taxi. It will take 120~140 CNY to bring you to Nanjing Metropark Hotel, Nanjing Metropark Hotel, or Zilu Hotel on the campus of Nanjing Metropark Hotel. Go ahead after your exit and you will see a shuttle bus ticket office, book a ticket for Nanjing Down Town (20 CNY), take the bus to Nanjing Down Town, and take a taxi after get off the bus. It will take 20~30 CNY to bring you Nanjing Metropark Hotel, Nanjing Metropark Hotel, or Zilu Hotel. 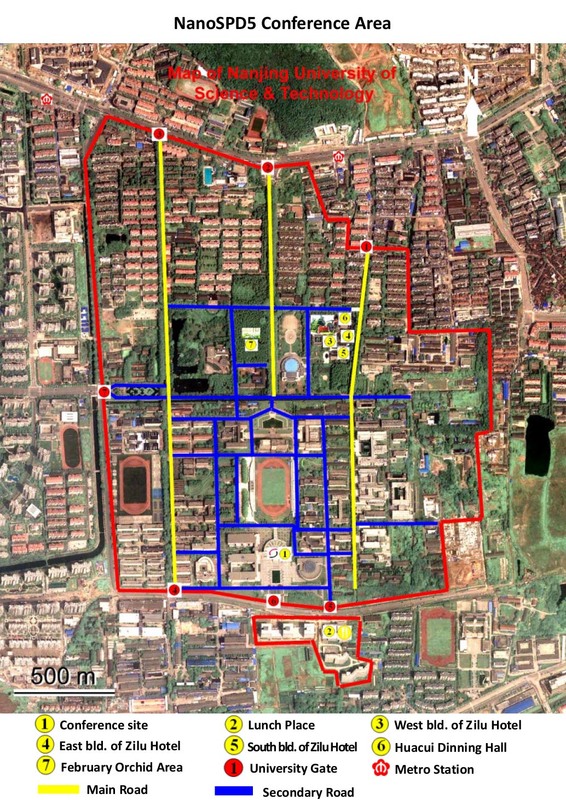 NanoSPD5 will be held in Nanjing, an ancient and also a modern city in the eastern part of China. 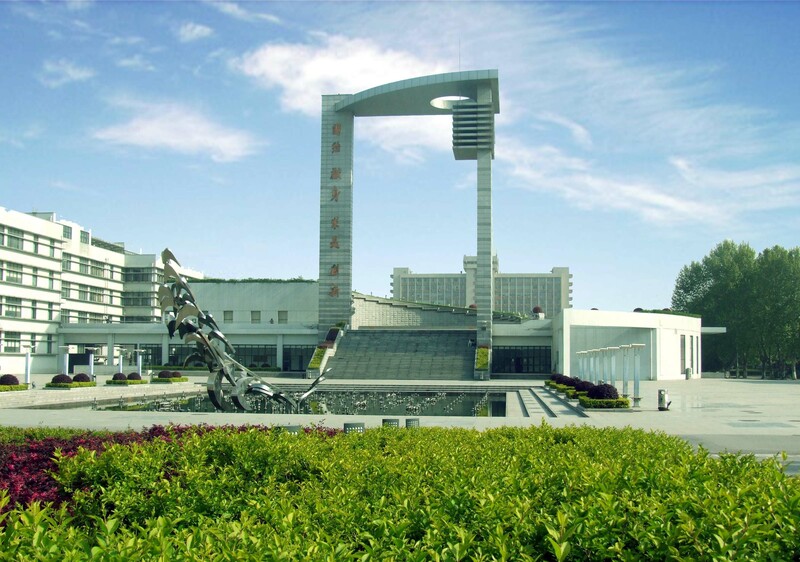 The conference will take place at the campus of Nanjing University of Science and Technology .